The Galaxy Tab’s forward-facing camera allows you to record yourself, and its camera app allows you to upload and share videos to the internet or directly to individuals through email. The secret to shooting yourself is to touch the Switch Camera button. As soon as you see your punum on the touchscreen, you’ve done things properly. The front-facing camera uses only 640 by 480 resolution , though it’s ideal for attaching to an e-mail or text message. The secret is to find the Upload or Share command. When you do, choose the option to Capture Video. After that, you see the Camera app in Video mode, where you can quickly capture a few seconds of real life. After you’re done recording, you return to the other app, where you can add a title, comments, or do other mischief with your video. 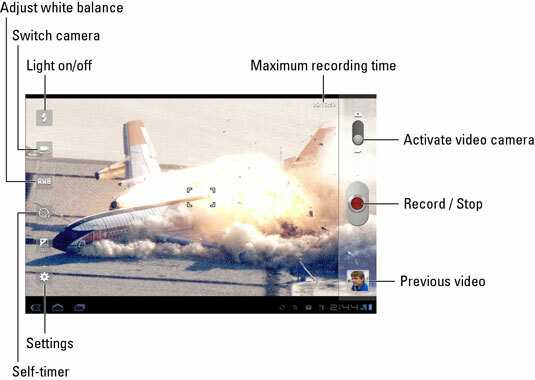 You can attach video to a Gmail or Email message, but you must first record the video. Recorded video is saved on the Tab, and you access it through the Gallery app. In Gmail or Email, touch the Attach button and choose the Gallery as the source. Find your video to attach and then send the message. Keep the video message short! Short is good for a video message attachment or an online post.